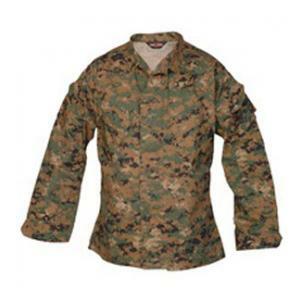 This long sleeve BDU shirt is made of a 65% polyester, 35% cotton twill blend. It has a 4 pocket design, slanted chest pockets have snag proof button flaps with pencil pocket openings, sleeve pockets have snag proof button flaps, adjustable waist and cuff tabs, reinforced elbow patches with removable padding and a concealed button front placket. US Materials Sewn overseas. This Shirt is not military issue.